Gili brought this because she missed playing it, and we set it up while waiting for Eszter. Gili wasn’t sure Eszter had ever played, I thought she had, so I looked it up. 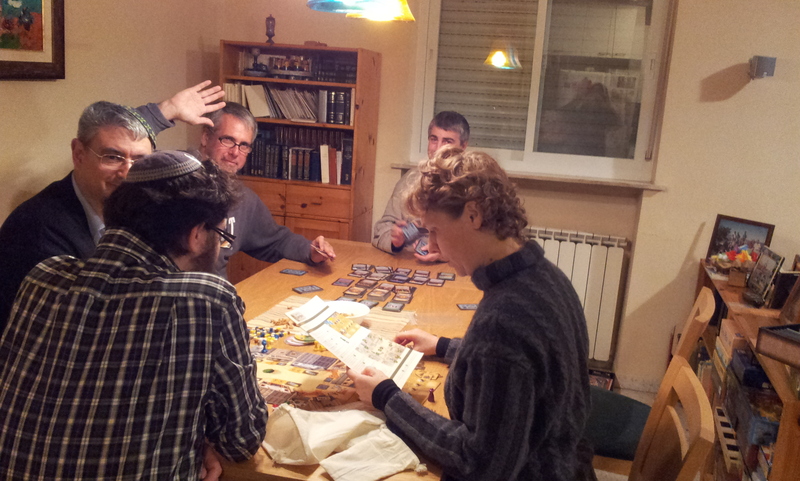 Eszter had played for the second time at Gili’s house on Chanukah Games Day two years ago; Gili didn’t remember seeing the picture of her house. Gili got two Jesters for 300 in the first two turns. I never paid more than 200 for anything; I took two Prestige cards early on, selecting ones that would give 7 points rather than 8 because I was more likely to have the items. 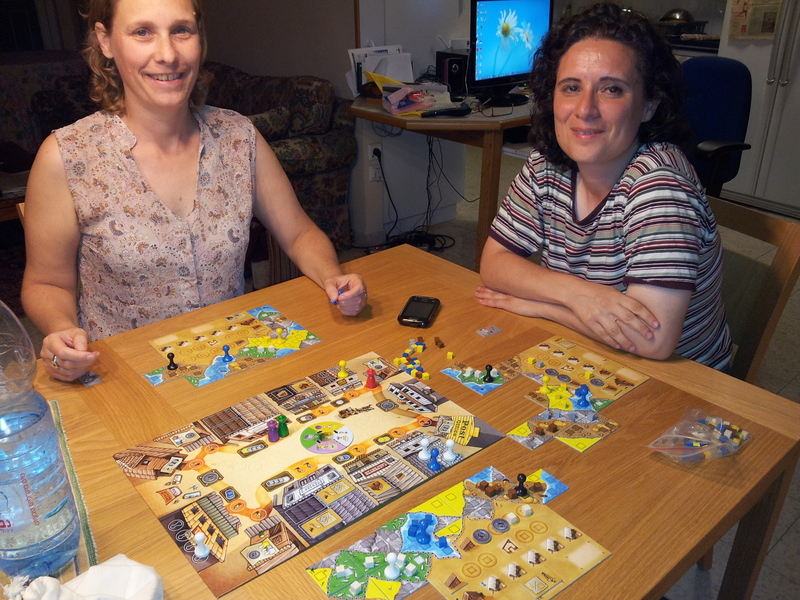 Eszter didn’t remember how to play so Gili explained, but it takes a while to understand the mechanics and timing. Eszter had a lot of buildings, two builders, as did Gili, and all the landscapes. I played the most works but only got best work once. Gili had leftover money worth 3 points, so we would have tied. Eszter got 19 points from coats of arms, but only had 5 missions. I had almost as many, but she won most of the types to get more. Gili had 9 missions, I had 7. I was going to play all my cards on the last round, good thing Gili noticed in time. I could put down one last piece from a mission card, to get my fourth chip. 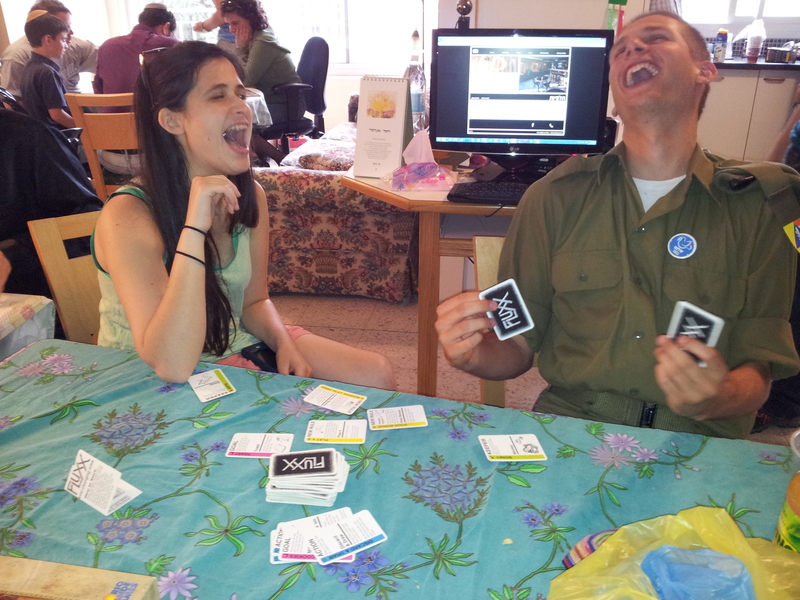 David, Gili, Eszter, Nadine, Matan, Mace, and Shachar dropped by to kibbitz. Welcome back Gili, from her vacation in Greece. Good to get feedback, I need to work on things. Everyone figured Mace would win, but they did a good job against him. First play for Gili. First play for Matan who wanted to try this. David did a good job with the book action, he was far ahead in turn order the whole game, easier to do with three players. I did well, but couldn’t compete. 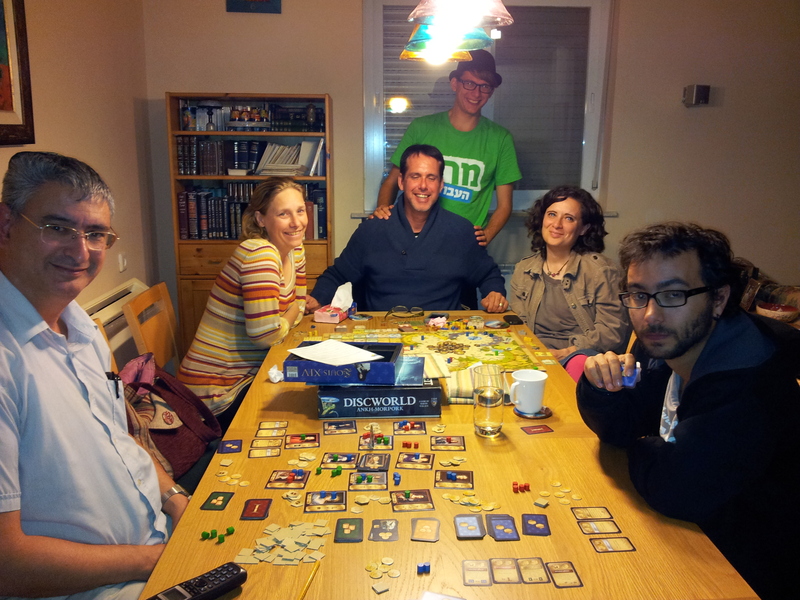 I went first at the beginning, David overtook me to go first, Matan was last the whole game. We had all the taxes and wars at the beginning, and disease and rice in the second half. I had bad cards the last round, though I don’t know if that would have made much of a difference. Again first play for Matan, who caught on well. 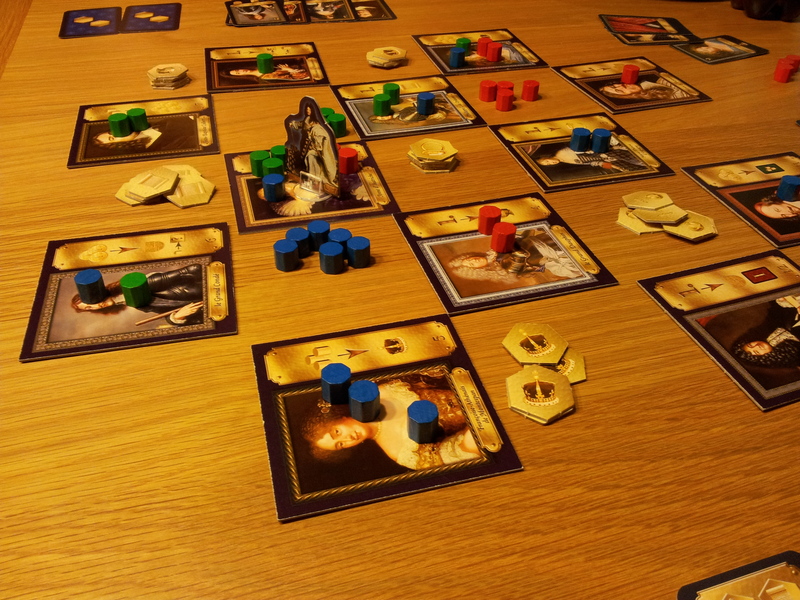 He liked this game, he also liked Year of the Dragon, but Louis XIV is easier to play well your first time. Despite complaining, David had good Mission cards, including the joker 4, though he couldn’t take advantage of it on the last round; he also played well and took the king most rounds, Matan took it once. 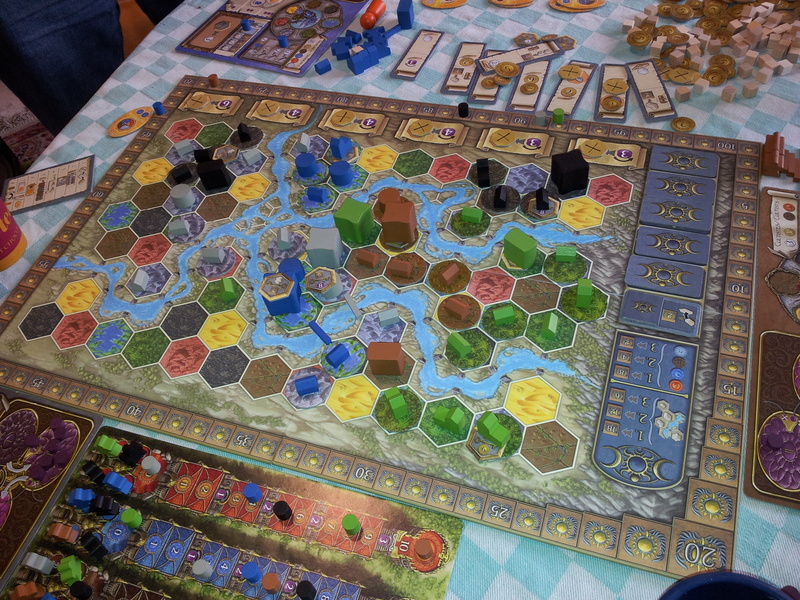 We played both games while the others played Tzolk’in. David was going to come with Avi but wasn’t feeling well. Eszter had played once but didn’t remember much, but it’s easy to catch on. You never get to do everything you want. I was able to plan but it’s still hard. I was lucky with tiles, they were all pretty good, and I managed to get 4 closed areas. I took two bonus tiles though I lost coin points because I didn’t have the cubes. If I had realized I’d have closed areas I would have taken that bonus tile, but I got points from the points for bonus tiles one and for huts. Eszter had a bonus tile for huts, she had bought a hut and barn, I just had a barn, Gili had for coins. Eszter took 4 coins at the end instead of a farmer, but only got one point. Gili had 4 workers, one more than we did. She didn’t realize that the board edge didn’t count as closed in, but since that was the last tile she placed we let her move to where it did close in an area. Gili and Eszter sold at the end so I couldn’t, I got my second bonus tile. We enjoyed playing the game. Gili’s favorite game, though it’s work to play, a lot of thinking. I thought I had bad cards but they weren’t so bad. I couldn’t get a second card on my first turn and lost a chip, same thing happened to Gili later. The game is easier and less competitive with 3. We played with Gili’s card point variant. 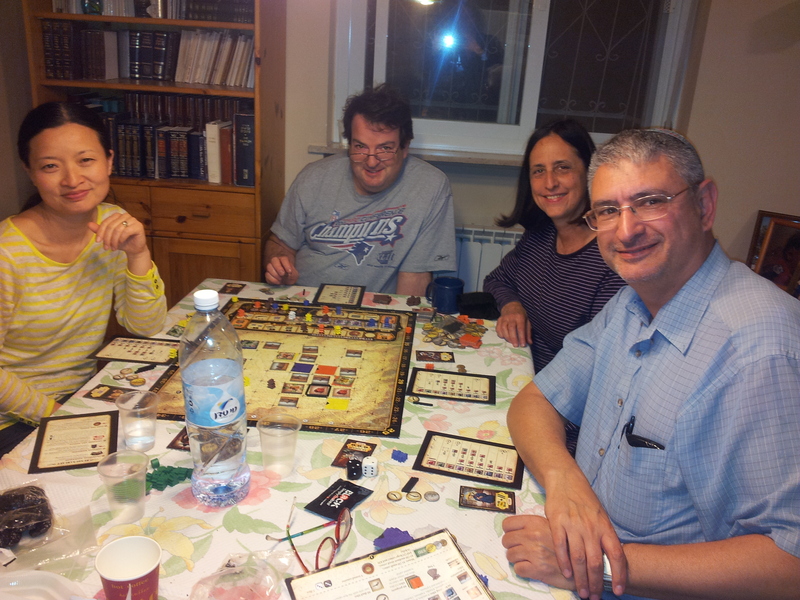 Gili had 6 points from shields, I had eight, and Eszter had 20. I had mentioned at the beginning that someone once won on shields, which is almost what Eszter did because she had far fewer cards than we did. The next game was much harder, a lot of attack cards. All the urchins were bought, none by me, but I got some later from the pick from the trash card. 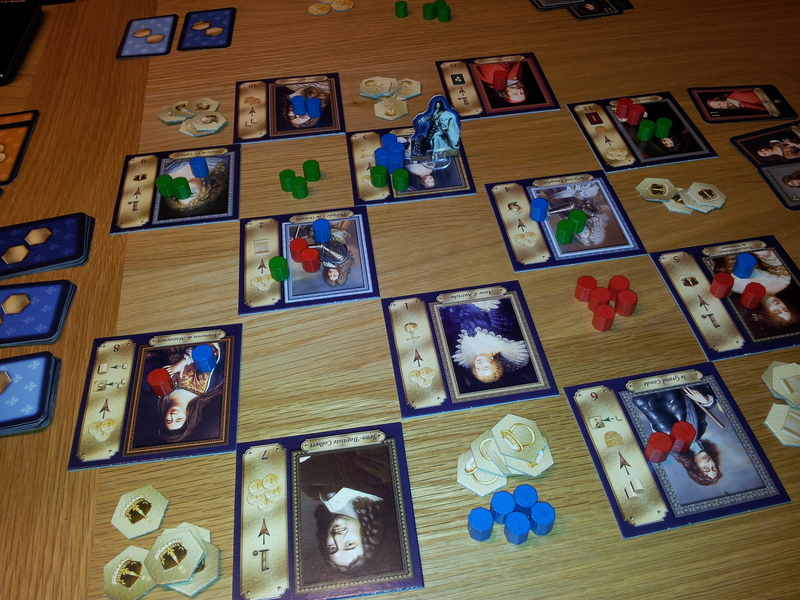 Jon also had mercenaries, Mace too, so I never had more than 4 cards, often 3. Once or twice when I played an urchin it hurt Mace. They rarely hurt me, once or twice at the beginning. But I had a hard time deciding which cards to keep, with cards that let you pick a card and not having enough actions for the other cards and wanting the money on them, I picked wrong at least once. I had a few discard your deck cards which were good for getting to use golds. I had 5, 6 or 7 a lot, and already had golds, so I started taking duchys because the others were already taking a lot of provinces. So I won because of the duchys, I had 6 and 4 provinces and some estates, Jon had 6 provinces but not enough other cards. None of us thought I was wining, we thought Jon was far ahead even if he complained about how he was doing, though Mace complained more, and was right. I didn’t trash any cards, Jon did a good job with that. Gili had played once, when we played wrong. She said it wasn’t so tough the right way. We heard David complain several times that he had made a mistake that would cause him to lose. He was right that having to discard 3 chips because they weren’t the right ones for his cards is pretty bad. But he won anyway. They all played 8 mission cards. David and Jon wanted to play Tichu, but that would have left two people in a game, and it was still pretty early. And we thought the two last games might go faster and leave some time. Mace didn’t remember how to play, I haven’t played in a long time and made some mistakes. Jon complained a lot about his lack of shipping points, he had 10 late in the game, which meant Mace and I had a lot. I could have figured out how many Mace had, or even realized he must have a ton, if I had thought about it. I made some mistakes, which Jon of course didn’t point out in time for me to do anything about. I could have bought a second big building if I had built, which was my plan, but I forgot and shipped, leaving only 9 when Jon built, so I got a wharf. So actually I should have beat Jon, though not necessarily, my points from shipping and wharf probably equaled a big building. Mace spent a long time figuring out moves once he caught on to the strategy. Mace and Jon had harbors, Jon and I had factory, Mace and I had wharf, but he got his earlier. Mace had a coffee monopoly, but was behind in money because of our factories. I miss playing this with people like Jon who understand the game at the level he does. Jon knew Mace was doing well in shipping and ended up being correct that his two big buildings, guild hall and customs house, didn’t stack up against 41 shipping points. We gave Mace a few tips; he did some things we wouldn’t have, but that’s what’s great about PR, most things help you. 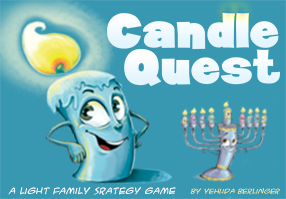 Fifth night of Chanukah. Gili and Eszter hosted while I was away, they played Louis XIV and Princes of Florence. 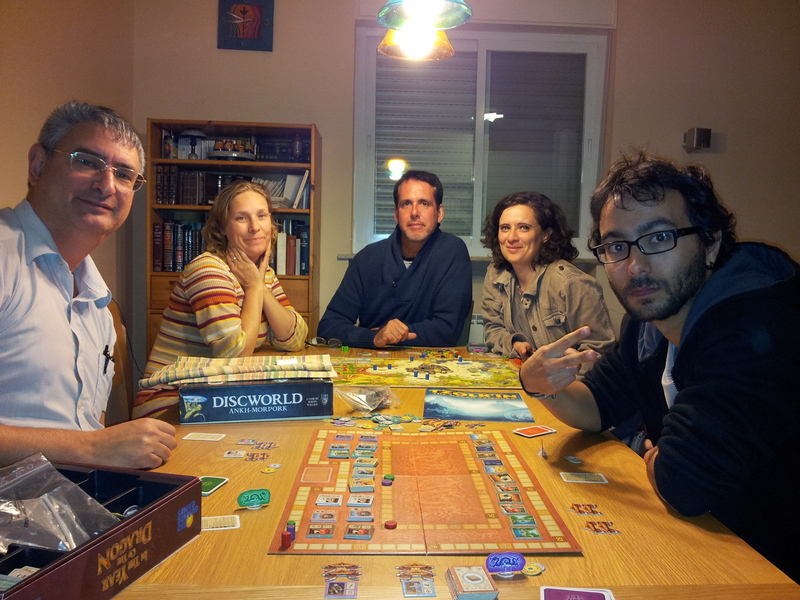 I played It’s Alive!, Trivial Pursuit, Bridge and Scrabble with my family in California. Five people had said they were coming. I spent 45 minutes sorting and setting up Hawaii, which my nieces and nephews had helped me punch out in California. Maybe quick once you know how, a puzzle board, more different pieces than Shipyard, so far the record holder, little huts – I realized after assembling them that the roofs need to match, of course all 5 were wrong. 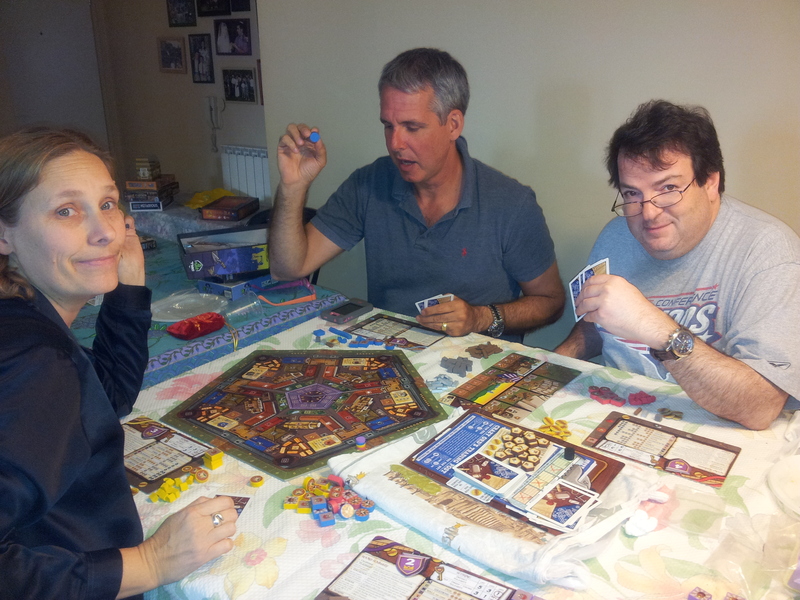 So I hadn’t finished reading the rules by the time people arrived, and we started working things out. 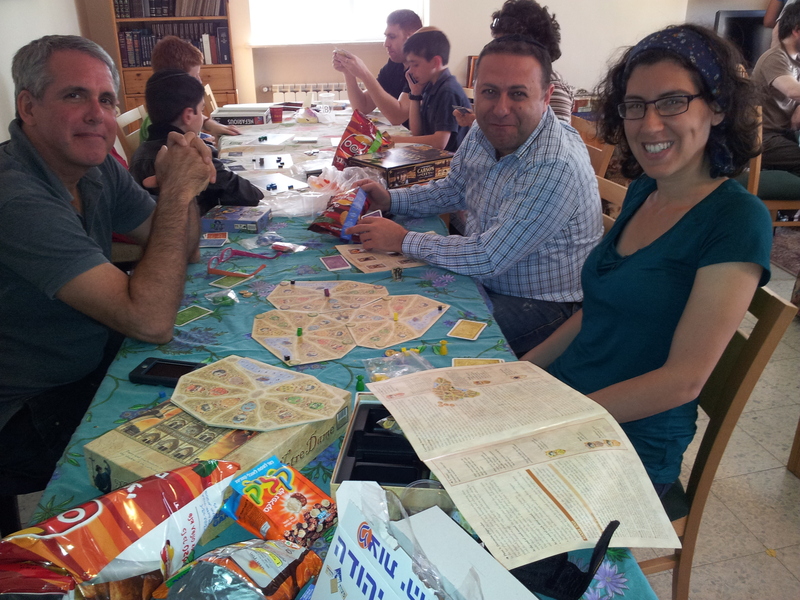 Different people showed up than expected, and we were 6, Eszter and her son Binyamin were happy to be a team. So we played and corrected rules as we went. We did pretty well, but different people missed different rules. And after one or two rounds we had a better idea of what we should have done strategically. The rules were very clear that you can’t mix types of purchasing resources, I was willing to play that you could, though there’s no good reason to change rules before playing at least once, we didn’t. We all assumed that the resources you receive each round increased as the game went on when it turned out to be the opposite. We used the wrong resource quantity card, the next one rather than the completed one, but were able to make up for it when we realized, and gave out the extra resources. 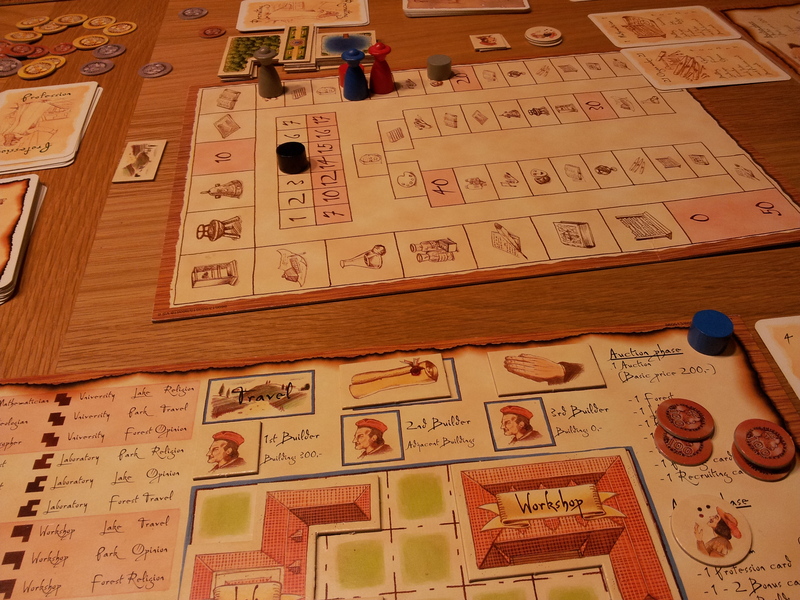 There are two main scoring systems – during and at the end of each round of 5, and end game for your village set-up. Round scoring is difficult and competitive, I gave up on it after getting the extra 6 points for being first one round. End game scoring is limited too, you can’t repeat buildings in a village, and most give you resource benefits rather than points. The spear scoring bonus card which gives points every time you get a relevant chip was strong and is why Eszter won. The fruit strategy is also strong due to synergy of gaining resources and getting bonus points for the cards; I had zero fruit. I did have the card that let me pay only one foot to travel, which was handy. Gili had the bonus for boats card, which explained why she got a third boat. Hersh did well with fruit and tikis. Cliff didn’t understand the end game scoring, he had arrived late. He won the most points bonus on at least one round. The art and variability is very nice, and there is a good choice of strategies. We all liked it except Cliff, and look forward to playing it now that we understand how it works. Now that we know what the pieces are, and they’re in the 15 or so baggies that came with the game, the set up won’t be hard. After playing, Cliff said he puts it in the same category as Shipyard, a game he doesn’t like, but he’s more of a wargamer than a Eurogamer. He asked why I bought it, I said I didn’t, I got it from my Secret Santa, along with Walnut Grove. It was on my wishlist as a 3 – I only had two 2’s, both filler games, which is what we need but makes me hard to shop for when my Secret Santa apparently wanted to get really nice games, which is appreciated.